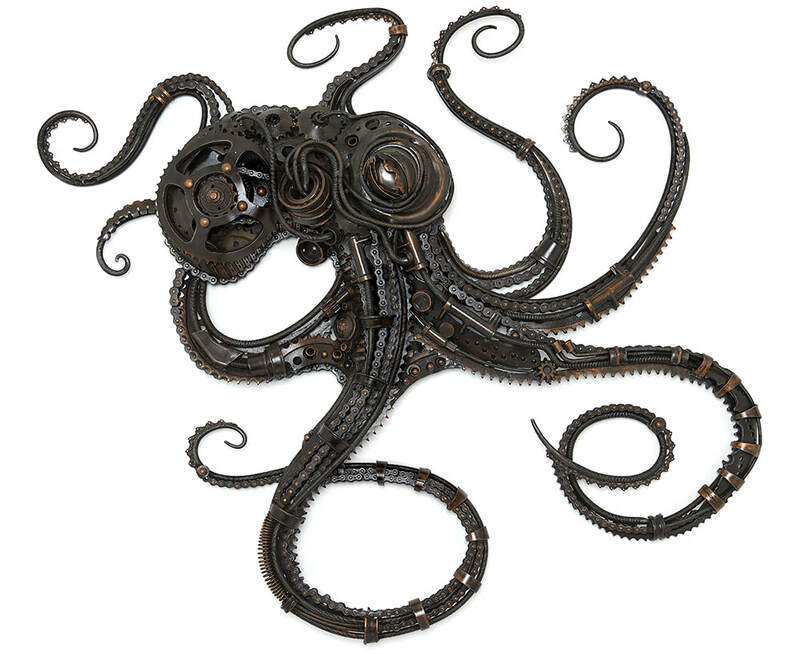 OCTOPUS - Made from 90% motorbike parts, 10% threaded bar and found objects. 130cm wide. PHEONIX - Private commission. 8 feet tall, galvanized steel, 3mm sheet copper and glass. 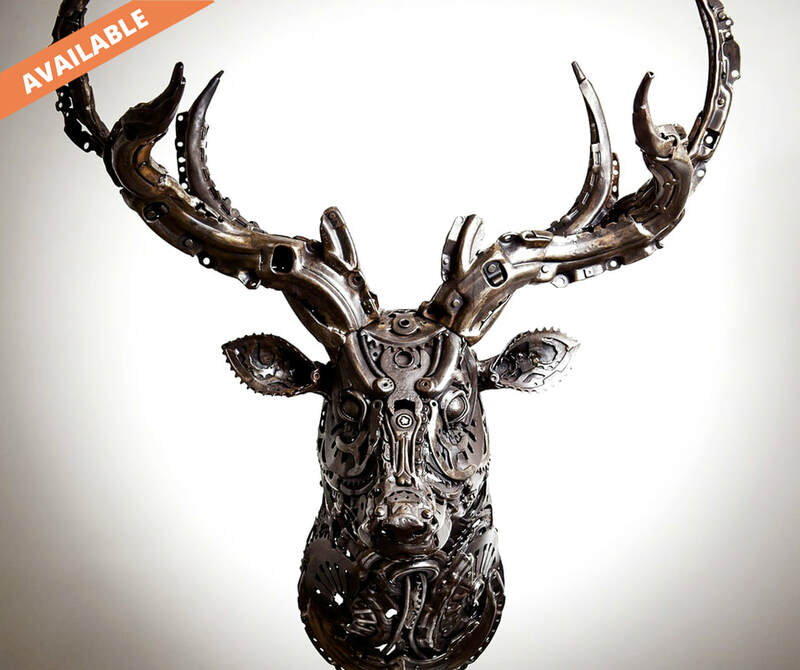 Other materials include knives, forks and spoons, threaded bar, forged steel and motorbike sprockets. 2.2m tall. 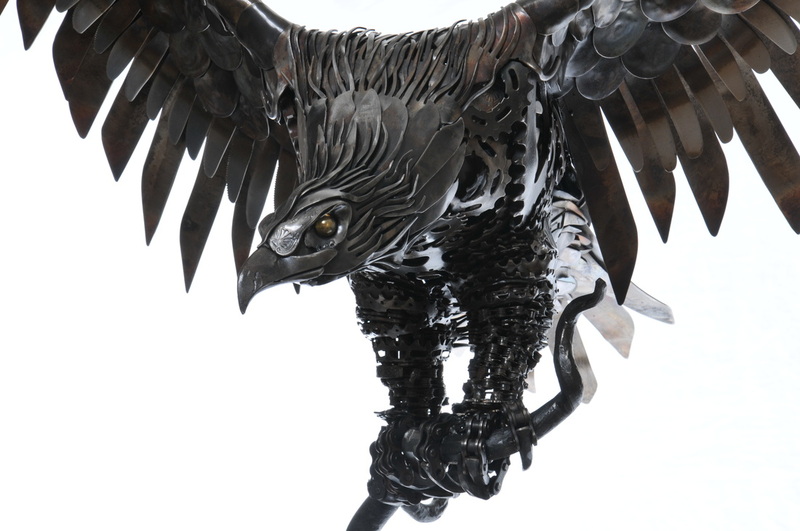 EAGLE AKA 'DINING OUT' - Mounted on a forged branch attached to a 5ft sea defense post. 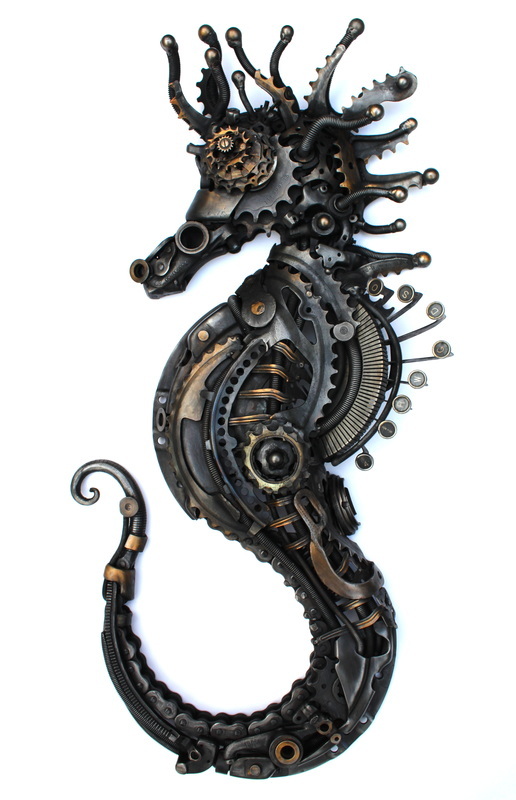 This piece was made from knives, forks, spoons, threaded bar, forged steel bicycle cogs, chain and gears.​220cm x 110cm. OSPREY - Mounted on a branch attached to a 5ft sea defense post. 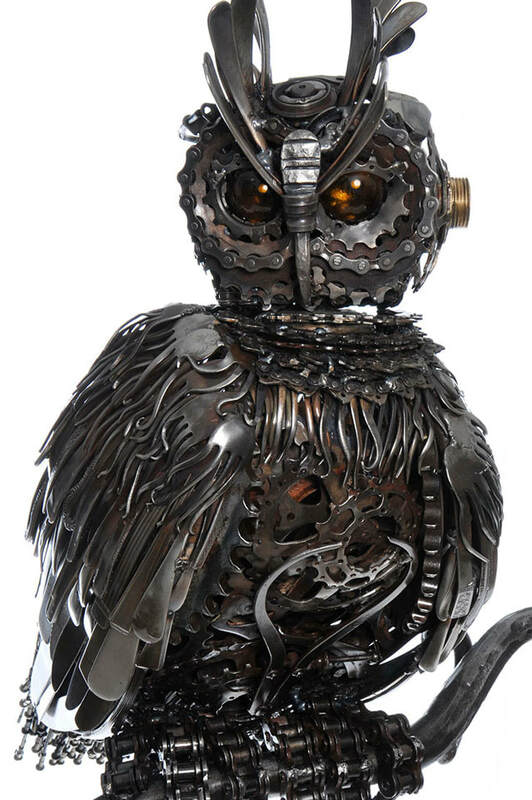 Comprised of knives, forks, spoons, handles, clutches, motorbike and bicycle gears and chain. 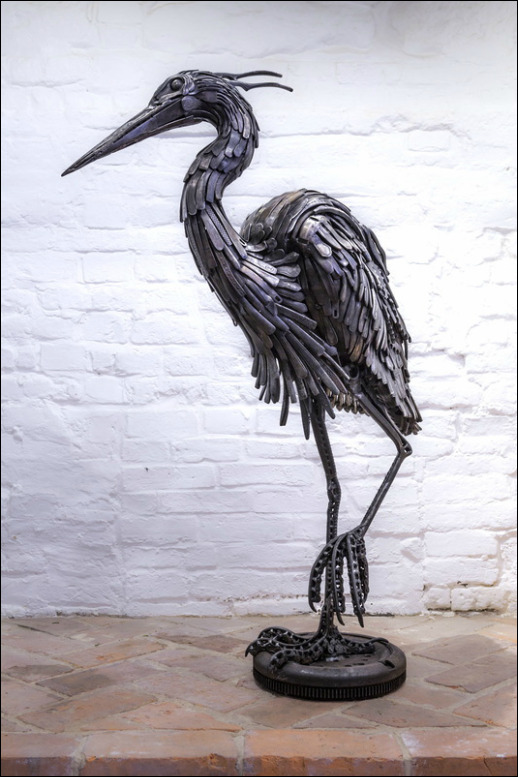 HERON - Made from spanners, motorbike chain, car clutches, knives and forks. 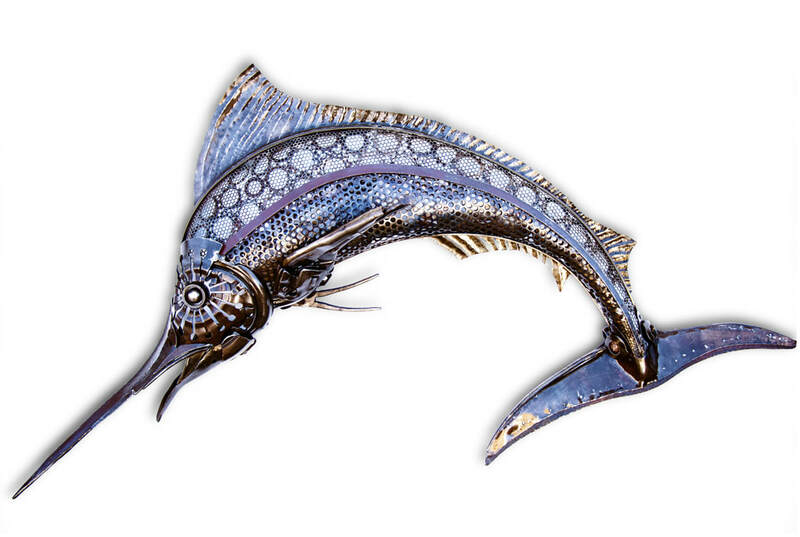 BLUE MARLIN - Commissioned by the sea life centre in South Korea. 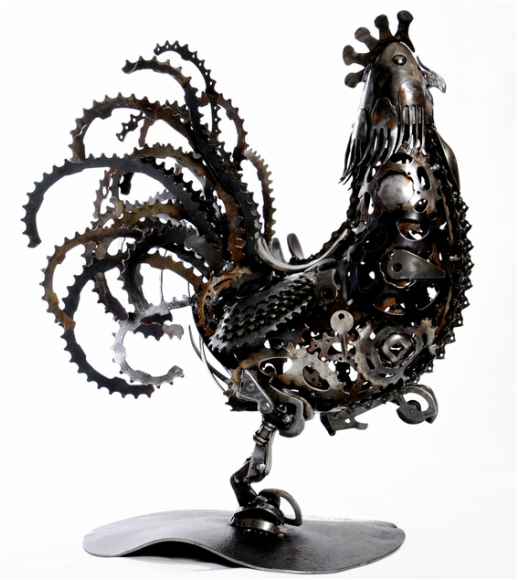 Made from retired tools, car clutch, bicycle gears, forged sheet, mesh and angle steel. 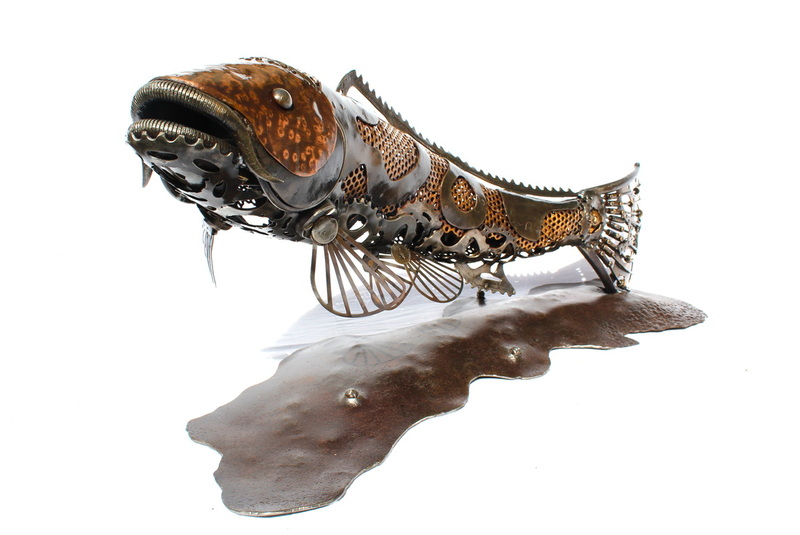 KOI CARP - This piece has a lovely movement to it and is made from steel mesh, copper sheet, bicycle cogs, threaded bar and old kitchen utensils. 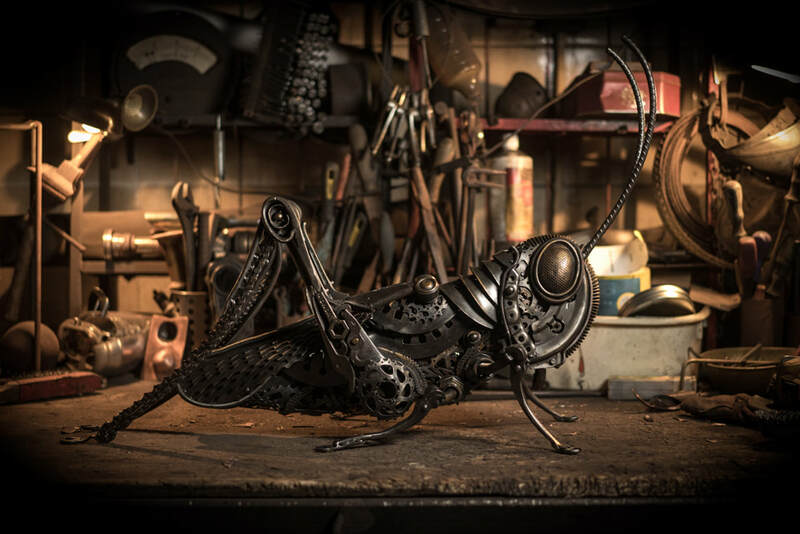 GRASSHOPPER - This piece was incredibly detailed on every surface. 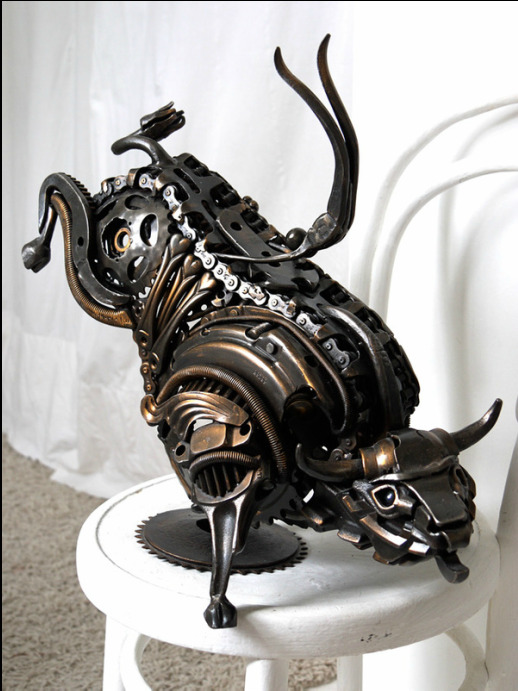 Made from retired tools, forged steel, kitchen sieve, copper sheet, saw blades, bicycle gears, car clutches and parts. 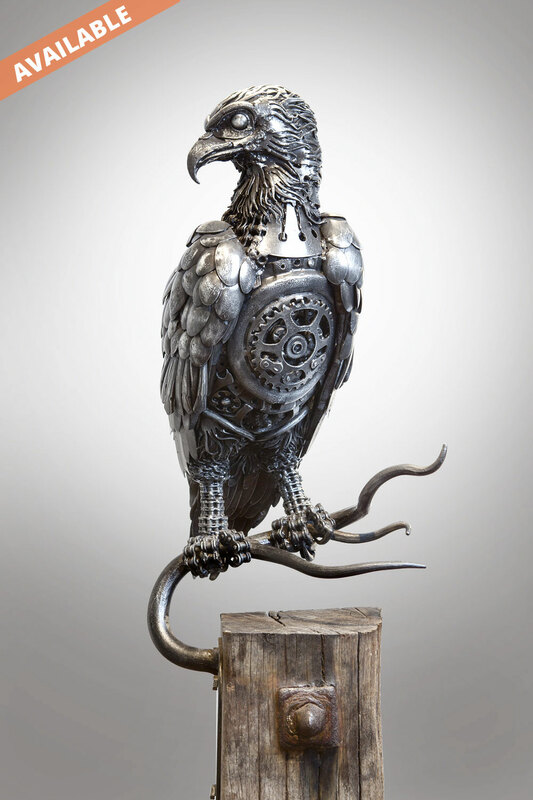 BIOMECHANOID - Found and forged steel. 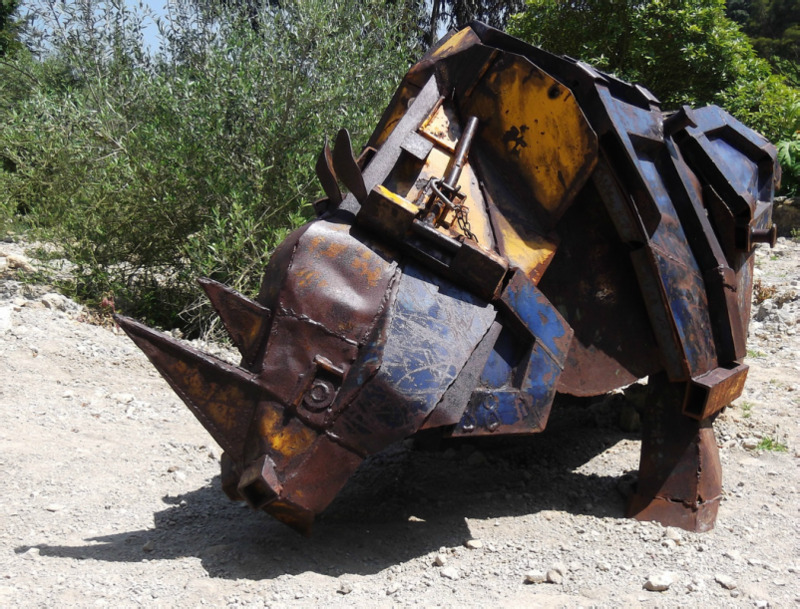 DJANGO RHINO - Waste skip (life size). 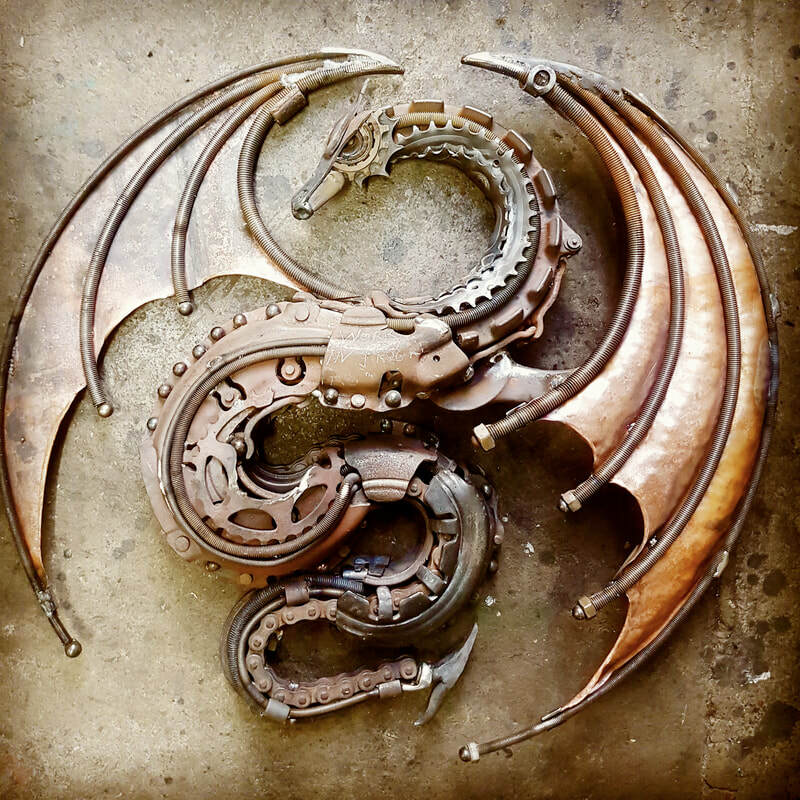 DOUBLE WINGED DRAGON - A wall mounted stylised dragon made from clutches, threaded bar, bicycle gears, forged steel, ball bearings and motorbike chain. 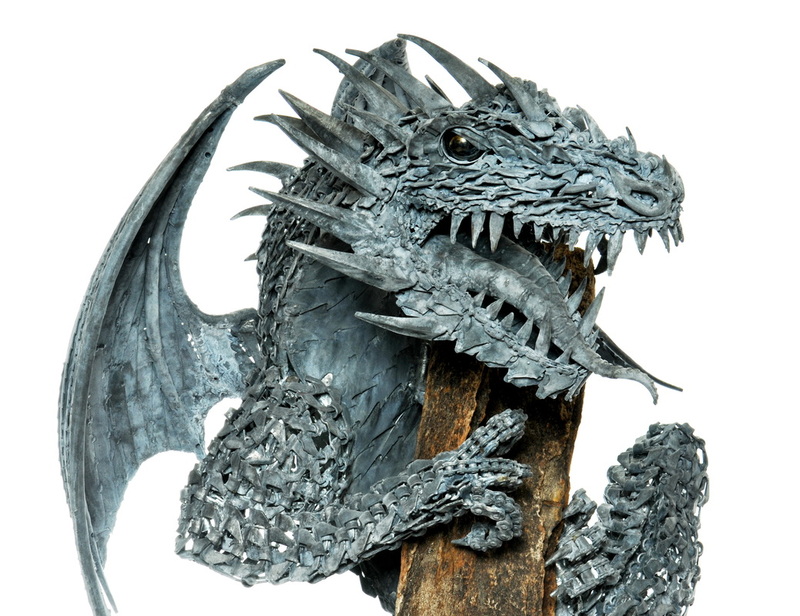 DRAGON WALL SCULPTURE - Motor and bicycle parts. 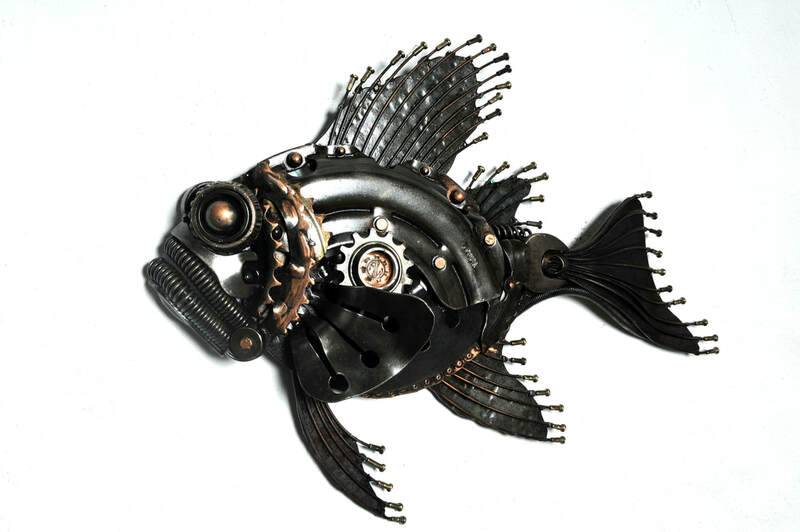 JOHN DORY - Made from car clutch, forged sheet steel, springs, retired tools, bicycle gears and spokes. 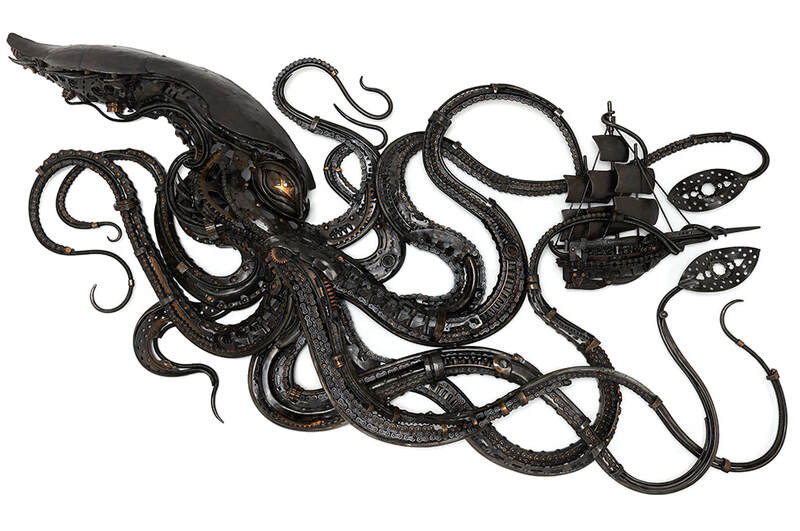 48cm wide. 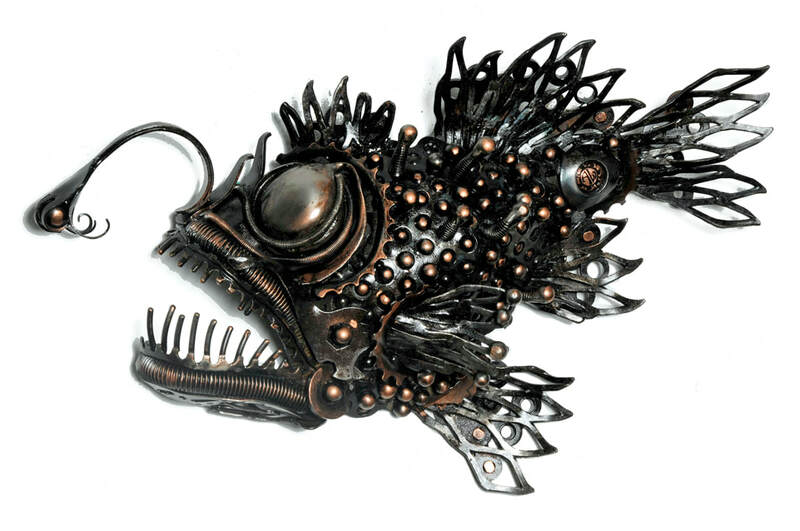 ANGLER FISH - Forged mesh, ball bearings, spoon, fork and threaded bar.